Opportunity is a fickle mistress, but sometimes she can be kind, even to geeks. No one is ever going to make the claim that getting into the videogame industry is easy. There are only so many jobs available, and there are people lining up around the block hoping to get them. At the same time, it's not impossible to do either, and people do make it, whether through hard work, luck, or a combination of both. In Issue 299 of The Escapist, Greg Tito talks to his former classmate Jeff Libby, whose lifetime of geekiness helped him score a job with Lord of the Rings Online developer, Turbine. One of the only positions available to an out-of-work lawyer was at Houghton Mifflin, the American publisher of all of Tolkien's books. Jeff was already a fan of Tolkien's work (he's read Lord of the Rings every year since third grade), but he now devoured the wealth of source material found in The Silmarillion, Unfinished Tales, and all of Tolkien's notes published by his son Christopher. "The work was fine," Jeff recalled of his time at Houghton Mifflin. "Only in hindsight can I tell that I was biding my time for something else to come along." That something else was a brief mention by his wife after she had glanced at the Turbine website. 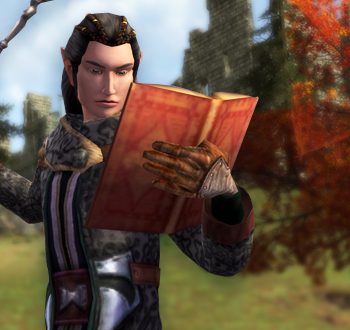 "As it happened, there was an opening for an Associate Content Designer on Lord of the Rings Online, a game that I had heard was in development years before but hadn't followed very closely ... From my wannabe-game-designer perspective, it was a perfect match." He knew he had only a hobbit's chance of landing the job, but Jeff pursued it like Gollum chased the One Ring. To apply, Jeff had to submit a writing sample. "I wrote a thing called 'Concerning Football,' which was supposed to be the account of a hobbit attempting to describe American Football to his bemused audience. It was stupid, but it must have come across as being Middle-earthy enough in tone," he remembered. After passing the first hurdle, Jeff was asked to design a quest and a dungeon space for it to occupy. "I agonized over both of them for the week provided, and was still up at 2 AM the night before they were due." Apparently, Turbine was impressed and asked him to come in for an interview. Libby is well aware that luck played a big part in him getting the job. But while he was definitely in the right place and the right time, he was also clearly the right man for the job. You can read the whole story in Tito's article, "Destined for Middle Earth"